We are looking for enthusiastic Consultants to join our existing care of the elderly physicians in providing a comprehensive range of elderly care services to the local population around Scarborough. Whether you are an experienced Consultant looking for a fresh challenge, or a newly-qualified Consultant seeking a supportive team, we look forward to welcoming you. Any sub-specialist interests can be accommodated, but an interest in acute elderly care would be particularly welcomed. Please see the attached job pack for further information about the role and department. The role provides access to a wide range of teaching and research opportunities. The Trust is part of the joint undergraduate Hull and York Medical School (HYMS) which partners the University of York, University of Hull and Hull and East Yorkshire Hospitals NHS Trust. Students are now well established and follow a five-year curriculum, which makes strong use of problem based learning techniques. The Trust provides a competitive relocation package; along with an exceptional Staff Benefits package to all employees, which includes salary sacrifice schemes and local discounts/offers. In addition you will receive an excellent Study leave package to support your on-going professional development and have access to a range of internal courses and support from our Organisational Development and Improvement Learning team. Applicants must possess MRCP or equivalent and be fully registered with the GMC and hold a licence to practise. Applicants should be on the GMC Specialist Register for Elderly Medicine and it is desirable that candidates have entry on the GMC Specialist Register for General (Internal) Medicine, via CCT (proposed CCT date should be within 12 months of the interview date), CESR or European Community Rights. We will work with you to create your job plan and can offer opportunities for cross site working. Where it is a requirement of the service, you should be prepared to work across any of the Hospital sites managed by York Teaching Hospital NHS Foundation Trust. 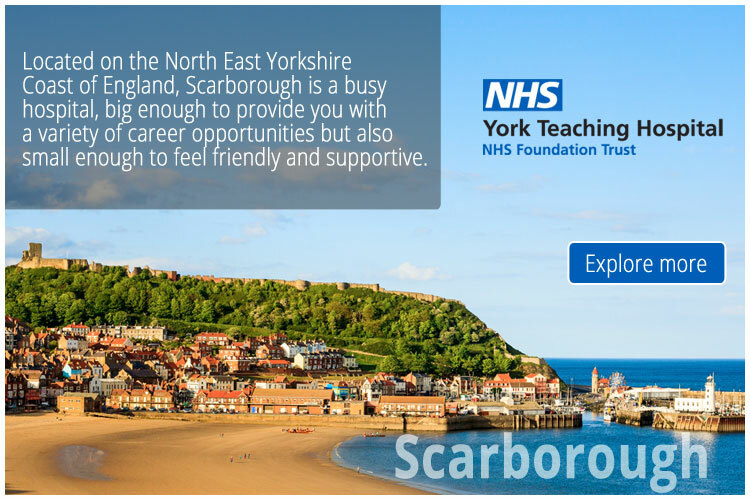 Hospital sites include, York, Scarborough, Malton, Bridlington. What happens after I apply ? If shortlisted, we will invite you to an Assessment Centre on 26th February, 2018 where we will ask you to participate in 2 activities. The activities may consist of a hand written exercise, or a group activity / single activity where you may need to present to a board panel. All details will be provided on the day and there is no preparation required in advance. If you are successful at our Assessment Centre, you will be invited to attend an interview which will be held on the Assessment Centre day or following day. Full details will be provided to you if you are shortlisted to attend.